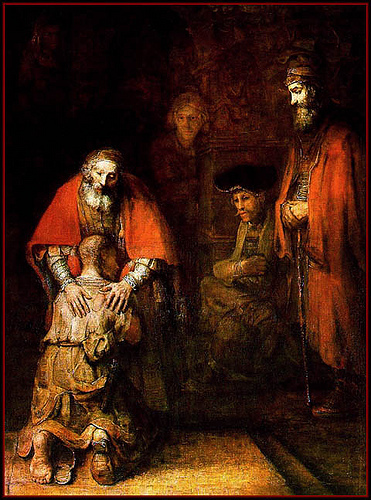 In 1963, Henri Nouwen became captivated with Rembrandt’s Return of the Prodigal Son. He even went to St. Petersburg to spend time with the masterpiece and subsequently wrote his own work of art, The Return of the Prodigal Son. He analyzed every detail of the painting and with the text of the biblical story, tells the tale of reconciliation not only for the obvious prodigal, but the need for it even within the Father’s household. This past week, I had my own little captivation with El DeBarge’s song Second Chance. Of course, it is not a Rembrandt painting, but it did remind me of the heart of a prodigal. I know many prodigals, and am one too in many ways. DeBarge’s prodigality is pretty well-known, but in this song, this song he wrote after a couple years in jail, he turns his face toward home, toward the Father’s house. While his sins are obvious and well-documented like those of the returning son, some of us are in our own “distant country” like the older brother. We dwell in our own lands of prejudice, fear, shame and hate. We may appear to be in the Father’s house, but we are “distant” from the Father’s heart, which is at the center of His house. The prodigal son’s brother could not understand – in fact resented – all the excitement and joy over the return of the son because his heart was in “a distant country” – where there was no room for love or joy. He was far from the Father’s love. I am afraid many Christians are like that. Easter Sunday, the day Christians all over the world remember that Jesus Christ conquered death in his resurrection, is mankind’s greatest second chance. He made redemption, reconciliation and rebirth possible for those far off and for those who are near. We have a second chance to be courageous or clean and sober or kind and compassionate, even Christ-like, but also a second chance at a new life. Happy Easter, folks!